You must be careful if you are looking for the Havana beach life. 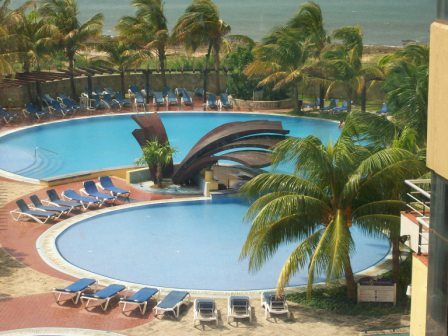 Swimming is restricted in Havana to hotel pools such as the Oasis Panorama (above) because of the ocean's rocky shoreline and polluted waters. Happily there are great beaches you can reach in under 30 minutes in the Eastern Beaches region. The nearest beaches are in Playas del Este, which is a 25 minute drive from Central Havana. If you book into one of Playas del Este's hotels you have the advantage that they are “all-inclusive”... unlike Havana hotels which may include only breakfast. The disadvantage is that these hotels are generally sub-standard, with small rooms and mosquitoes. However, the fantastic beaches make up for these disappointments. If you are staying at a beach hotel, they provide a bus service to Old Havana several times daily, with returns. The charge is minimal or you can just tip the driver. The desk clerk can explain the formalities. This can be an easy way to experience the beaches in addition to the excitement of Havana City. Watch where the locals swim and you should be okay. You can find thatched umbrellas for a reasonable rent, as well as bars, watersports, and hawkers wandering the sands with ice cream and other snacks. Playa Santa Maria del Mar is the most beautiful of the three beaches in this area. The gorgeous aquamarine waters are sheer heaven, but in springtime can hide jellyfish and are known to produce rip tides. 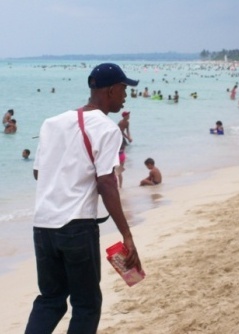 Be very careful of your belongings on the beach; even though you will see police watching the crowds, they can turn a blind eye when you are in the water and a bag snatcher does his work. You can ask the hotel desk staff to watch your bag for a modest tip.